A lunar eclipse occurs when the Earth gets between the Moon and the Sun, covering the sunlight as seen from the Moon. This should happen every full moon, but these eclipses take place once or twice a year instead. (¿Do you want to know when the next one you can see will take place? Go to the Nasa Lunar Eclipse website.) And the same could be said about solar eclipses, which should happen every new moon but do not. So why is that? 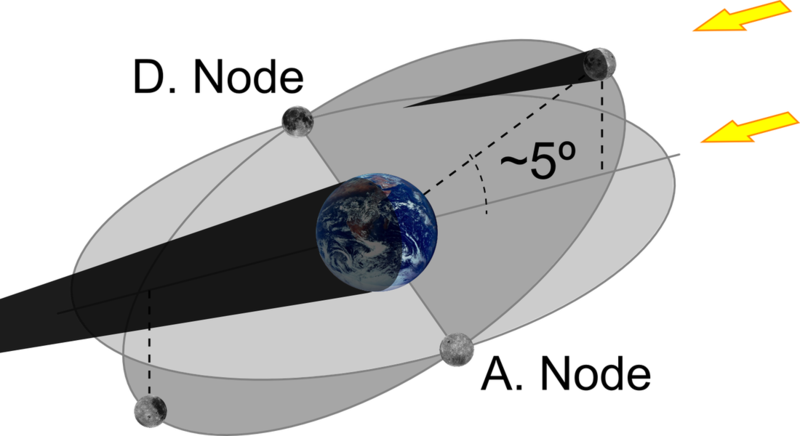 The reason is that the orbit of the Moon is tilted about 5º with respect to the Earth–Sun orbit, so during full moon the shadow of the Earth goes either too high or too low—if I may talk about up and down in space—missing the target. The orbit of the Moon crosses the Earth–Sun plane two times with every revolution. These two points are called nodes. (“A” for ascending node and “D” for descending node in the sketch.) Only when a full Moon happens exactly at a Node will the shadow of the Earth occult our satellite. If we have a new moon in a node then we will see a solar eclipse. A perhaps obvious difference between eclipses of the Sun and Moon is that while a lunar eclipse can be seen from anywhere in the night side of the Earth, an eclipse of the Sun will be seen only around a few kilometers (more about that in solar eclipses). This is why for a given location solar eclipses are much more rare than eclipses of the Moon. So what can you see in a lunar eclipse? Although much less impressive than solar eclipses, these events are beautiful. I believe it is because seeing change in the sky, so still every night, is always exciting. But there are more rewards in a lunar eclipse. The most obvious thing to look for is the earthshine. During the totality of an eclipse (when the Moon is completely inside our shadow) you will notice that you can still see the Moon. How is that possible? Because part of the sunlight that gets to the Earth is bent in the atmosphere and eventually reaches the Moon. Of course this process depends largely on the state of the atmosphere at that moment, which explains why we get from close to perfectly dark eclipses to bright brick-red eclipsed moons. So no two lunar eclipses are the same really! 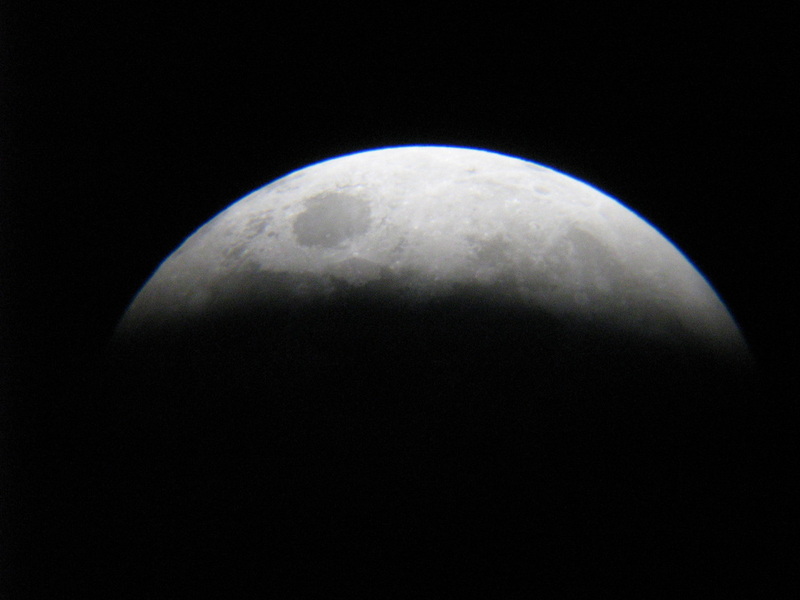 Lunar eclipses offer a great chance to let your creativity go! 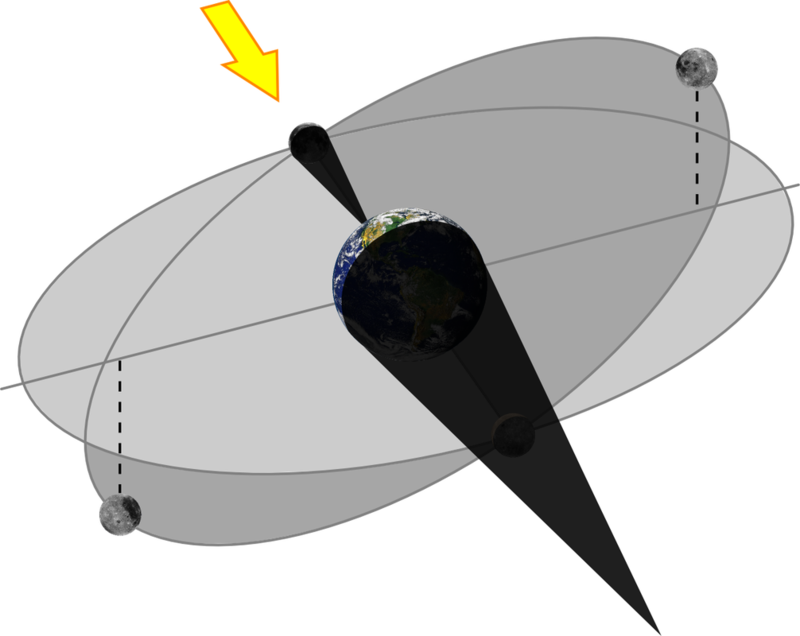 First, the curvature of the edge of the shadow corresponds to the diameter of the Earth shadow at that distance, not to the curvature of the Moon like any other time. This shadow is about two times as big as the moon (the red circle in the diagram). 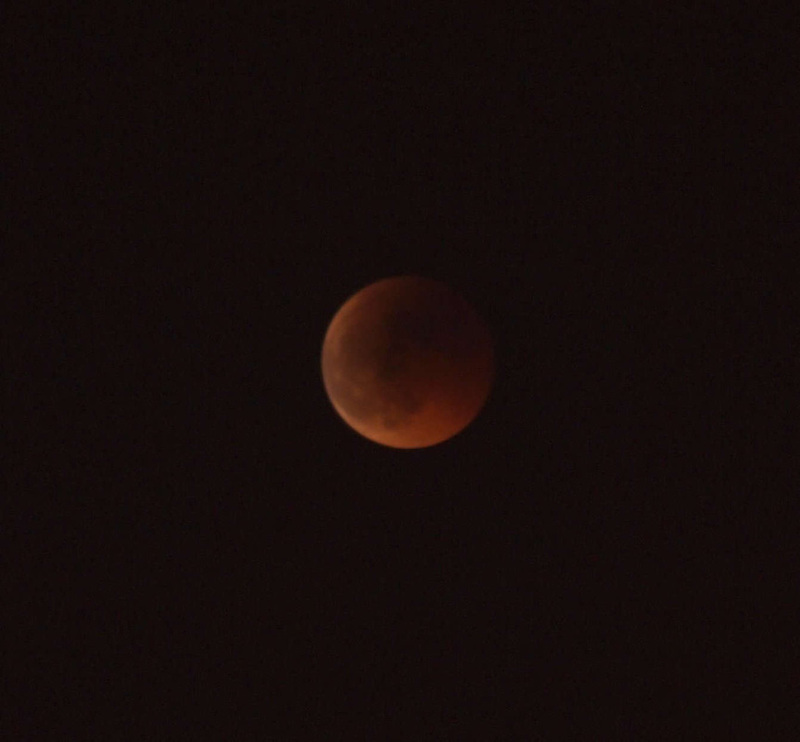 The second weird thing is that you can see no craters nor other detail during a lunar eclipse. This is because the light during full moon arrives almost perpendicular to the lunar surface (just like midday in the Earth's equator). So eclipse or no eclipse, you cannot have shadows in a full moon, and that means no detail, even along the false terminator. This doesn't certainly sound very exciting, but if you have some experience observing the Moon with a telescope, it will look weird. Bottom line is: lunar eclipses are cool, but remember, it will get cold.